Cryptic Tweet teases the release of much-requested new tool. 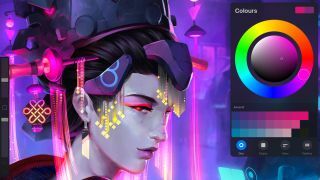 Thanks to its cutting-edge tools and easy-to-use layout, Procreate has won over a legion of dedicated users. Nothing's perfect though, and if there's one thing that's caused digital artists a bit of a headache when it comes to using the multi-award winning iPad app, it's the lack of a Text tool. Judging by a recent tweet from the official Procreate account though, all this looks set to change. This morning Procreate whipped Twitter up into a frenzy with a simple status and a GIF of a blinking text cursor. There's no mention of a launch date, no accompanying link to a blog post telling users what to expect, and yet artists knew it was time to get excited. Choosing not to give away further details is a ballsy decision. Either Procreate hasn't got a release date in mind, or if it does, it knows that a text tool is so in-demand that it wouldn't hurt to generate a bit of publicity by being cryptic. Either way, it's a power move we respect. At the moment, if a Procreate user wants to add text to their work, they have to write everything in another app or system and then transfer it across. As far as workflows go, it's a bit of a headache for what feels like quite a basic function. Of course, as an alternative, lettering can be created by hand in Procreate. This is where the versatility of the app's Apple Pencil support really comes into play as its nibs can create a variety of fonts, especially calligraphy fonts. For digital artists who aren't typographers though, this is a time-consuming and tricky process. And for them, the imminent text tool could be a godsend. To keep up to date with the latest developments on the Procreate text tool, pop over to its Twitter account and give them a follow. Of course, if we've all misinterpreted this Tweet, the app could be in for some serious backpedaling.